Tragic fall: Gold Coast parishioners come to grips with the tragic circumstances of the 23-year-old’s fall. GOLD Coast parishioners are still coming to grips with the death of a 23-year-old man believed to have fallen through the skylight of a church. 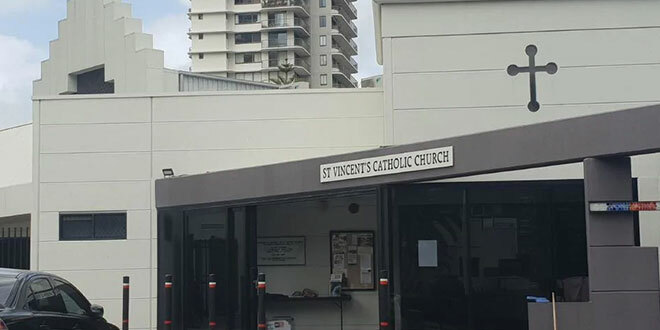 Police say it appears the man “had been climbing on the roof” of St Vincent’s Church, Surfers Paradise, about 2am on February 24, hours before Sunday Mass. It is understood the man, from Wales and who worked in a building close to the church, was among a group of five others who climbed onto the roof, before falling 10 metres to his death. The church was declared a crime scene and Sunday Masses were cancelled. Columban Father Warren Kinne, who ministers in the parish, said he was turning people away on Sunday because Masses had been suspended. Parishioners did just that the following day. Fr Kinne dedicated Mass to the man who died, prayed for him and reconsecrated the church and the altar close to where the man fell and landed. “The Church is a beacon, and it is important the Church is here,” Fr Kinne said referring to the physical presence of the Church in Surfers Paradise.